PULASKI, Va. - Exactly two months from the Appalachian League's 2019 Opening Night, the Pulaski Yankees are excited to announce their 2019 promotional schedule, with promotions for all 34 games to be played at Motor Mile Field at Calfee Park. PULASKI, Va. - The Pulaski Yankees and the American Cancer Society are excited to announce a new partnership ahead of the team's 2019 season. The multi-faceted partnership features Yankees' participation at four Relay For Life events in the New River Valley, as well as fundraising efforts throughout the season at Motor Mile Field at Calfee Park during Pulaski Yankees' games. PULASKI, Va. - The first ever Pulaski Yankees 5K race will take place on Saturday, June 1, 2019. The run/walk will begin at Motor Mile Field at Calfee Park, wind towards downtown Pulaski and hit town running trails before ending with a lap on the warning track at the ballpark. Winners will be recognized on-field prior to the June 23rd game against the Bluefield Blue Jays during the Yankees' Opening Weekend. PULASKI, Va. - The Pulaski Yankees and Calfee Park Baseball are excited to announce updated renovation plans for Motor Mile Field at Calfee Park. Construction is underway at the ballpark, with most upgrades taking place along the third baseline and in left field. PULASKI, Va. - The Pulaski Yankees today announced the start times for all home games at Motor Mile Field at Calfee Park for the 2019 season. All games will begin at 6:30 p.m. with the exception of an 11 a.m. first pitch on Field Trip Day on August 20. PULASKI, Va. - The Pulaski Yankees today announced the coaching staff for the 2019 season, as assigned by the New York Yankees. Luis Dorante, Pulaski's manager in 2017, returns to Calfee Park after spending the 2018 season with the Trenton Thunder. He is joined by pitching coach Gerardo Casadiego, hitting coach Scott Seabol, defensive coach Teuris Olivares, athletic trainer Manny Ozoa, and strength and conditioning coach Larry Adegoke, all of whom have served on the coaching staff in Pulaski in past seasons. 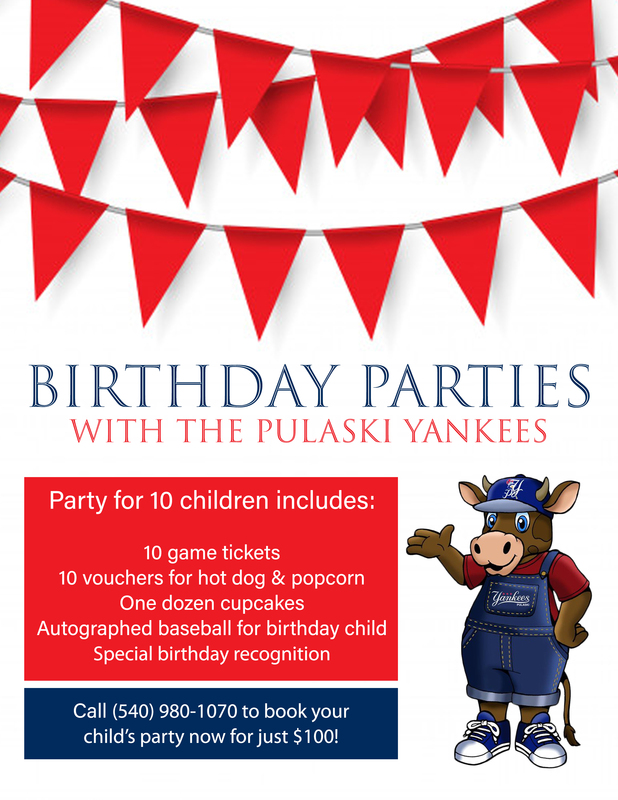 PULASKI, Va. - The Pulaski Yankees today introduced a new small business package to provide local businesses with smaller advertising budgets an additional opportunity to partner with the team for the 2019 season.